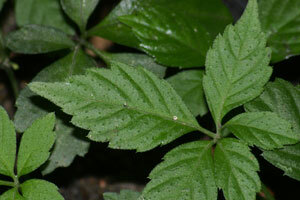 Jiaogulan is a Chinese herb, and an adaptogen with similar chemical properties as ginseng. Herbalist Chris Marano describes it as providing the clarity of green tea without the caffeine buzz. Unlike ginseng, which requires years of difficult growing to produce a medicinal root, we can grow jiaogulan as an annual in our climate and harvest the leaves and vines throughout the season. Jiaogulan also has antioxidant properties. As a member of the Cucurbit family (home to cucumbers and melons) it has a slightly bitter cucumber flavor. We like to dry it for tea or make it into a tincture. Combine with tulsi for a tonic morning tea. I have been really enjoying a cup of tulsi and jiaogulan tea in the morning instead of my daily green tea. I make the tea from the fresh or dried herbs, whatever I have on hand. The jiaogulan flavor has a bit of sharpness to it, and some might enjoy a little bit of honey added. I have also heard of adding jiaogulan to green tea and that sounds nice as well but I have yet to try it. As a tonic herb, take it for at least 4 weeks to feel the tonic’s benefits, and then once you plateau after a few months, switch to a different tonic then start taking jiaogulan again after a few months. Often we switch our tonics of choice around the changing of seasons. The leaves wilt quickly so once you receive your bag, be sure to dry or tincture them early on. In the mountains outside Asheville, North Carolina there is an herb farm called Mountain Gardens that I visited and the man who runs the place, Joe Hollis, has some wonderful videos up on youtube, including this one on jiaogulan. Definitely worth checking that one out along with the others. Use Jiaogulan as a tea or as a tincture.